We can only solve the e-mail overload problem by changing the behaviour of the people sending e-mail, not the ones receiving too much. Of course, recipients can help cause this behaviour change, as many of the great collaborators I have worked with demonstrate – back in the mid 1990’s Jim Moffat at Lotus used to insist on posting the answers to questions in a Notes database and send a link, to persuade people to go and search before they asked questions, while Steve Cogan, one of the early social role models in the IBM Collaboration Technical Sales team would send people links to his bog, files or bookmarks if they e-mailed him a question which was answered there, and asked those who should know better whether they had searched there first if he knew the answer was available, and Luis Suarez does such a good job of advertising the fact that he would rather receive questions via other means that he probably gets more apologetic e-mails than anyone else I know! It’s amusing to think that back in the mid 90’s, when corporate email was really becoming entrenched and the world wide web was just starting to appear, and people were philosophising about push vs. pull – with some of them even predicting a future where general access to the web would wipe out the market for e-mail! As it turns out, there were plenty of use cases to keep both busy, and each found its role. But I think (and hope) that Social Business is changing those use cases and shifting the balance. 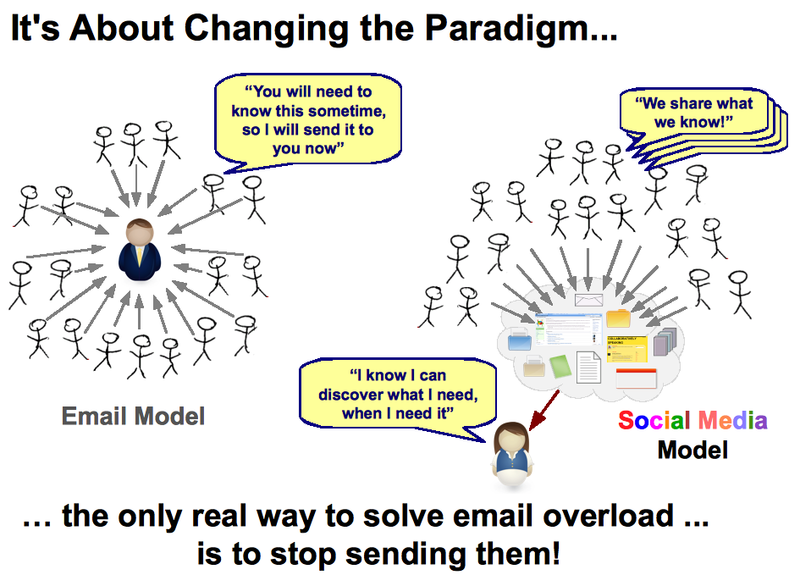 What is happening is that multiple movements are coming together to drive a gradual change in the e-mail usage model. The most important is an understanding that to cope in today’s fast moving, globalised, highly competitive world, company cultures are shifting towards openness, sharing and transparency – deliberately moving away from the concept that "knowledge is power" to the concept that "knowledge used more powerful". Combine this with mature technology platforms, like blogs, wikis & social bookmarks, and the rapid adoption of these social sharing tools to address different use cases by public Internet users (who are also employees when they are not updating their Facebook page, Flickr photographs and YouTube videos, or having live video and VoIP conversations with their grandchildren or second cousin in Australia). These people bring an understanding of the value of social collaboration into the workplace. People are naturally social, and whether they exhibit that at their local football club on a Saturday afternoon or by joining an active live Twitter discussion about tonight’s X-Factor or Question Time, they are still being social. Similarly they want to be social at work, building trust relationships with the colleagues who they need to cooperate with to do their job and listening to news and gossip about what is going on in the rest of the business: who is joining or leaving or changing roles, what projects are starting or succeeding or failing or finishing, and hundreds of other things that actually help them to do their job better. Whether they do that around the coffee machine, in the canteen over lunch, down the pub on Friday evening, or whether they do it over e-mail, instant messaging or social media, many people realise they need their social networks to be good at their jobs – and they are the employees who deliver most to their employers. Of the alternatives, the social media option transfers more information, more effectively, to more people, than any of the other online options. What’s more, it does it in an open, transparent way that can remove the need for employee satisfaction surveys and manager appraisals because it is immediately apparent who is helping and who is wasting other people’s time. Who is truly achieving results and who is just claiming the results from the work of others. Only by encouraging adoption of social tools throughout the organisation can we build the confidence that users can either discover the information they need, when they need it; or that they can discover a person with the knowledge they need who can help them out. Not just "knowledge workers" but everyone with expertise to share, or needing knowledge or expertise from others, needs to become part of the enterprise nervous system provided by its social business platform. This entry was posted in Uncategorized and tagged social-business cosial business collaboration email social-software. Bookmark the permalink.